Backing out of the garage this morning, I went through the list… “Do we have our coats? The stroller? Water? Snacks?” Yes! So, we’re halfway down the hill and I notice sprinkles on the windshield… “Do we have umbrellas in the car?” Uhhh, no. This is California. It doesn’t rain here! 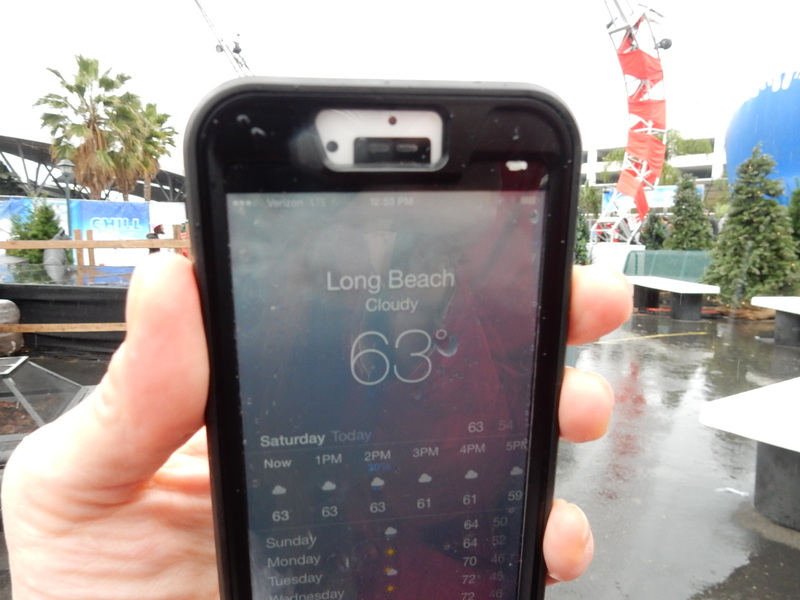 Yet, all the way, as we drove to Long Beach, there was definitely rain on the windshield. And, even if you try to deny it, say, by not using your windshield wipers, it is still rain! We arrived at the Queen Mary early, like at 9:10 AM (they opened at 10:00 AM), and we wandered around for a little while and then headed over to wait in line to get into the Village. 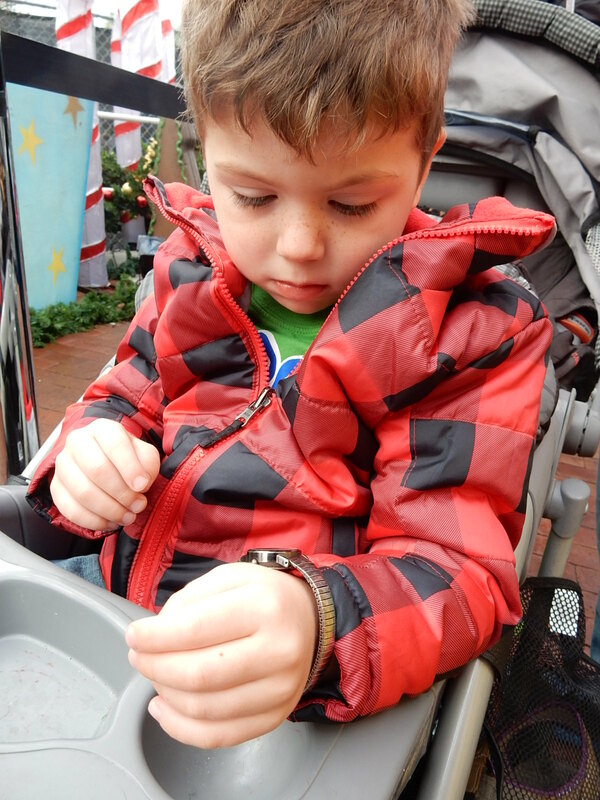 William was anxious with anticipation to get in, so I handed him my watch to keep an eye on it for the last 10 minutes. He told us he’d let us know when it was 10 o’clock. I was surprised when they actually opened the gates about 3 minutes early… thank goodness. We hustled past the Christmas decorations and bouncy houses so we could be the first in line for the ice sculptures. When we did this event a couple years ago (link), the line was really long to get into the ice sculptures and the workers were really grumpy (to be fair, it was the end of the day). This year, I even went down the ice slide and that was really fun! 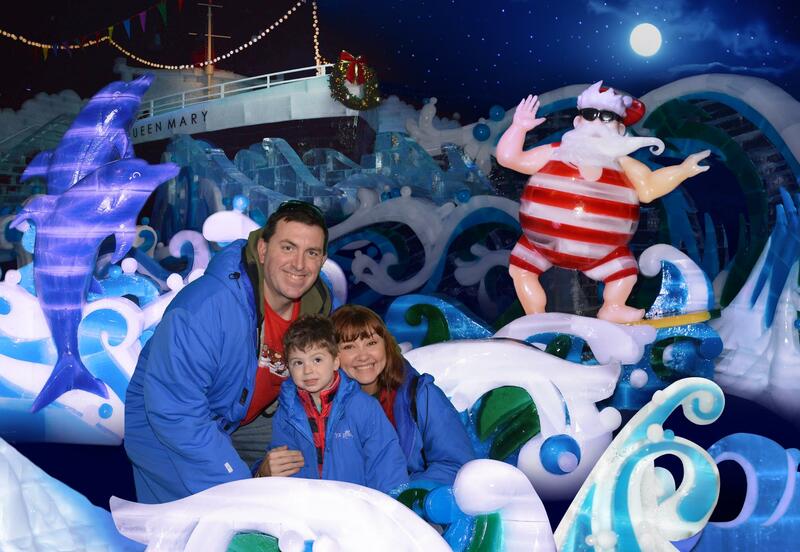 Overall, this was a far better experience than last time, although, sadly, there were far fewer ice sculptures this year. Admission to their Chill event included their village (that they decorate for each holiday) (that we had bypassed in our rush to the ice sculptures), and they had a couple bouncy houses (one that was shaped like the Queen Mary… it had a super weird entrance that kind of gave you the feeling like you were being rebirthed haha) and the other was a candy cane obstacle bouncer. William was disappointed that neither of them had anything to climb. We self-toured ourselves through the Queen Mary, walked to the bow and then went up top and splashed in puddles. 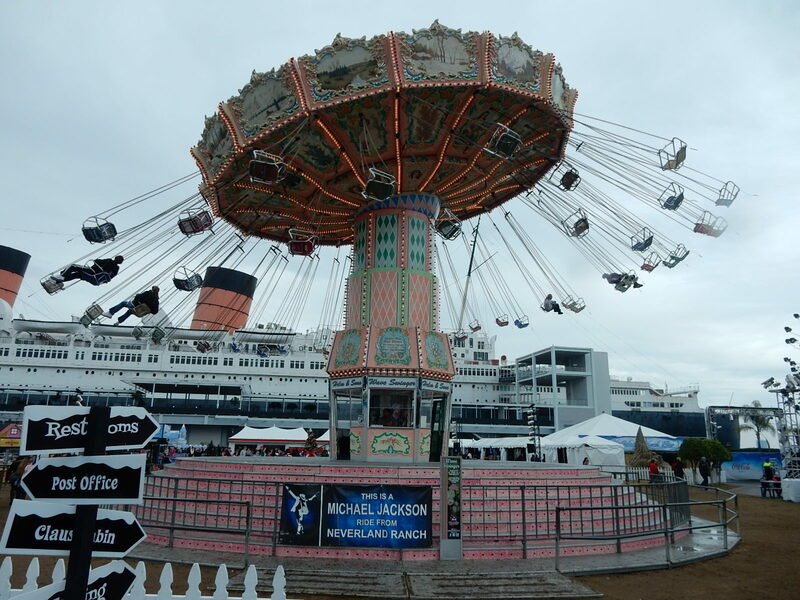 We headed back to the Chill event to find some lunch, because I’m far too cheap to spend $20 on a mere sandwich just to say we ate on board the Queen Mary. So we had a huge chicken skewer in the village with a view of the Queen Mary and rain pouring down on our heads. Because I was in denial at that point, because my iPhone told me it wasn’t raining. 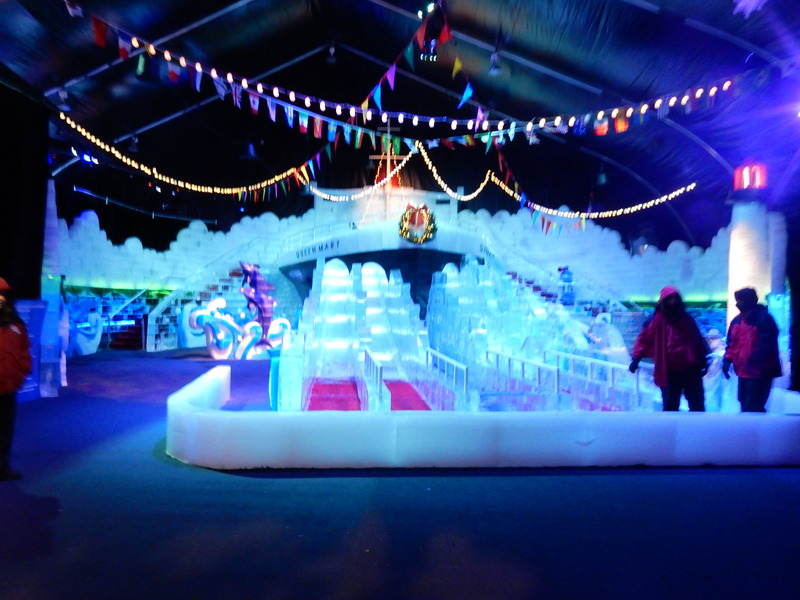 Overall, it was a good event… however, next year, if we do it again, I hope they will have more ice sculptures, like they did when we went in 2012. Although, even with the ones they had, it was impressive. I think I’d like to try to go during the month of December, because in January, there were no performances, no carolers and no Santa.